On September 11, 2001, the United States received a shock that hit to the core of every person in the country. A devastating terrorist attack that seemed to come right out of a Hollywood movie. It seemed neither real or possible. America found itself vulnerable. Out of all that occurred, something spiritual happened. We awoke from our defiance to trust in and actively include God in our lives as the rightful All-Powerful God that He is. We knew it before, but we just couldn't get ourselves to bow our knees in humble contrition and obey His words. This attack knocked us off our throne, and rightly gave that seat to God. Newscasts talked of God for the first time in years. God was credited for His "Amazing Grace" in song on national television. Politicians united to worship, pray and sing on the Capitol steps. What was recently viewed as "Church vs State" became obsolete. Something else happened. Jesus' words in John 15:13 came to life again. The first time was when He demonstrated it on a cross 2000 years ago. 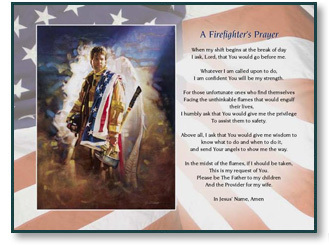 This time it took the form of brave firefighters, police officers and rescue workers from all over who considered the lives of victims greater than their own. "Greater love has no one than this, that one lay down his life for his friends." Every rescue worker whose life was taken that day followed in the path Jesus talked of. It wasn't a call to duty, or a job. It was a determination to give all they had for their fellow man. This painting is dedicated to all those who didn't consider it too much to give their all, and to their families who can take comfort in the knowledge that God saw their deeds and saw His Son's words come alive in them. 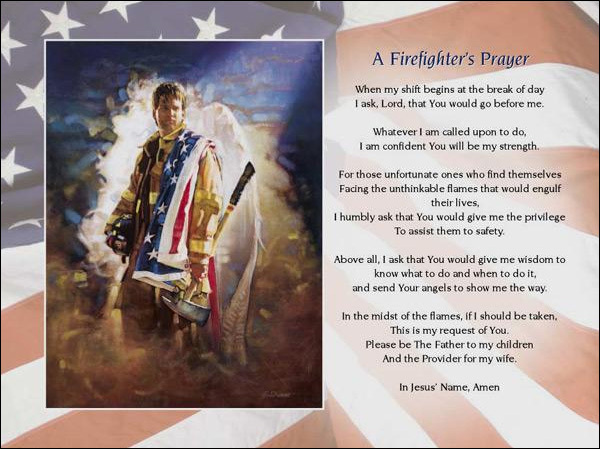 A Firefighter's Prayer copyright © 2002 by Ron DiCianni is prohibited from being copied.